Wait? What? Didn't I change things up enough around here already? As you may recall, last week my doctor strongly urged me to buy new shoes. I lamented that it would mean not being able to get my haircut. So, I decided to take up the shears on my own. Now, I'd cut my hair on my own before (click here for my post about my very first time), but once I went really short, I told myself it would need to be kept up by a professional. Well, my finances dictated otherwise. I am very satisfied with how well it turned out. Jeff is equally impressed and has assured me that it, indeed, does look professional. Sense of personal satisfaction and some pretty big bragging rights? Priceless. Have you ever cut your own hair to save money? What kinds of things have you done to score bragging rights? Your hair looks great! I also cut and dye my own hair as well as both my daughters hair. I figure if you have the ability to do it yourself then why pay some one else? Wow! I'm so impressed. 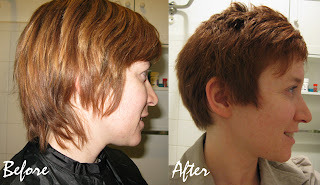 It's one thing to cut your own if it's long and it's a trim, but you did the real deal and it looks awesome! I buy the root dye kits and dye my roots to stretch time between professional dye jobs because my mom was so generous as to pass on her early gray genetics. 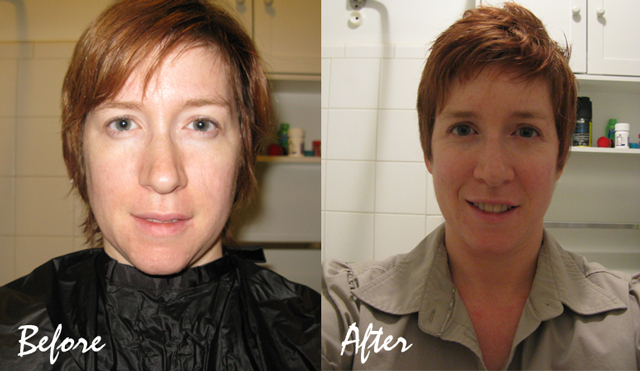 :) I also trim my own bangs to stretch haircuts - again, easier to do with long hair. 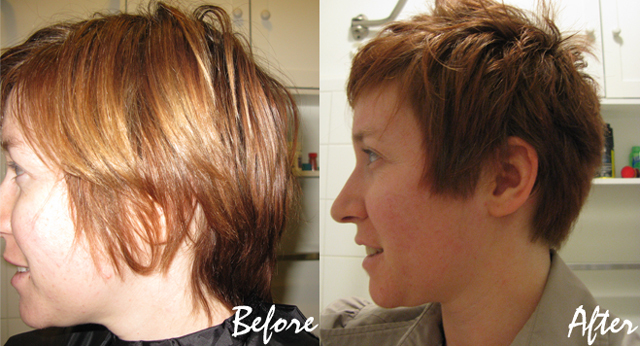 I did buy the good shears and blending shears some time ago - makes a world of difference. Such a good job! There's no way I could ever do that to myself.